I picked up a free local paper in Spain as you do, and noticed that this month there were marches of homage in La Axarquía to victims of the Spanish Civil War who died on the road from Málaga to Almeria. They take place on three Sundays of this month, in various parts of the locality, with the second today from El Borge to Torre del Mar at some 16kms. It ends with an act of homage in the Memorial Park in Torre. Here is a good link to this particular episode in the Civil War, and I have reproduced the last few pars which explain the tortuous exodus of the Republicans from Málaga. ‘The Nationalist forces approached Malaga on the 5th of February, 1937. They were comprised of some 10,000 North Africans, 5,000 Requetes (right-winged Militias), 5,000 Italians and plentiful supplies of trucks and artillery. They had only a few tanks and planes, but they used them with maximum effectiveness in the virtual absence of organised opposition. The Republicans were out-manned, under-supplied, and overly-divided. ‘On February 6th over 100,000 people were forced to make a mass exodus along the coastal road to Almeria. The road was blocked by slow vehicles and wounded people. Fascist air attacks and navy bombardment took their toll on the civilians. Many dropped along the way. Terrified villagers along the way did their best to defend the little food and water that they had but the numbers of the refugees and their need were too great. ‘It took two long weeks for the “Caravan of the Dead” (as the event became known) to reach Almeria. Here they found temporary help but Almeria was doomed to fall as well. Thousands had died along the way. The fall of Malaga and the ensuing evacuation of Republican civilians marked one of the lowest marks of the Spanish Civil War in Andalucia. One source reports that truck drivers were still finding the bones of some of those who had fled Malaga well into the 1960s. In the same paper, there was a separate article about the communal graves in Andalucía. There were more than 600 of these in the whole of Andalucía, and an estimated 50,000 people people were shot by the Nationalists (franquistas). The grave in Málaga of San Raphael, is the largest in Spain, with the remains of up to 3,000 people. (The above link quotes a higher figure, but as the newspaper is pretty recent, I will go with around 3,000. Ai! the problems of being a historian and encountering different information from different sources). Which brings me neatly onto the subject of novels/autobiographies about the Spanish Civil War. Since moving to Spain I have tried – without success – to track down a copy of George Orwell’s ‘Homage to Catalonia’. However, at my local library, I found another two Civil War books. Ernest Hemingway’s classic, moving, and sad novel ‘For Whom The Bell Tolls’. 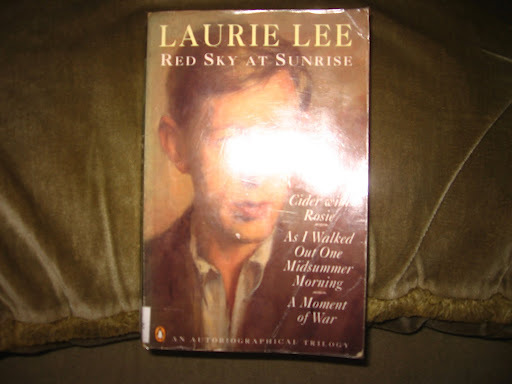 And Laurie Lee’s three-volumed autobiography, Red Sky at Sunrise. We read the ghastly Cider with Rosie at school and it bored me rigid. Reading about someone’s childhood memoirs in some village down south at the beginning of the 20th century was total yawnsville. However some 30+ years on I really enjoyed it. Clearly not a novel for young teenies but one for middle agedies. The next volume was ‘As I Walked Out One Midsummer Morning’ which recounts his trip from his childhood village to London where he worked as a labourer on a building site, and then he upped and offed to Spain – which he walked through from north to south, and included a detour to Gib. Rather him than me walking through Spain in the heat of the sun, but it made a great read having been to most of the places. The third and final volume ‘A Moment of War’ describes his time when he volunteered in the Spanish Civil War (for the Republicans). Another fascinating read. I recommend both the Hemingway and the whole Lee trilogy. I’m still searching for Homage to Catalonia, and another Lee book, ‘A Rose For Winter’ about his travels in Andalucia fifteen years after the war. Funny that I liked Cider at a young age (I was old before my time!) whereas the Spanish books which I read in my late teens did the same for me that Cider did to you because I suspect I knew nothing of Spain or the Civil war then. But learning about it, reading Hemmingway and then his third book again it was a great read. Lovely informative post.